Last Saturday I was preparing a cake for Robert's birthday and my hand mixer broke. Robert bought me that hand mixer our first Christmas together...I was sad to see it go. And immediately panic-y when I thought of all the Christmas goodies I had yet to bake! How was I going to do it without my faithful little mixer buddy? But my sentiments towards the broken mixer were soon turned around when I suggested we should just go use our Williams-Sonoma money from our wedding (I had been hanging onto it because who can justify spending $60 on a cookie sheet??) 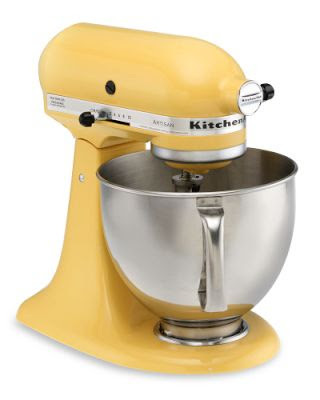 and just buy a KitchenAid already. You can imagine my shock and amazement when Robert said, "Ok! Get it!" Ooooo a kitchen aid....i am kinda wanting one now in lemongrass green...ps where did you find that cute template for your christmas card?? so cute! !